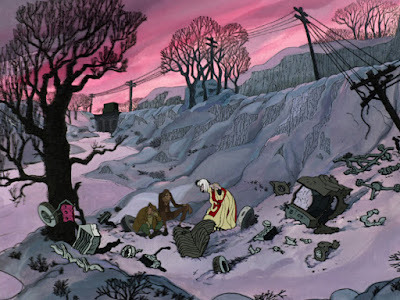 It's strange for me to realize that the most modern Disney animated feature goes back to 1961. That's over 50 years ago!! Anything that followed (with the exception of Sword in the Stone) went back toward more conventional realism, and with the advent of CG toward hyper realism. There is something very beautiful and important that's been lost. Stretching an audience's imagination by telling a story with visuals that are sketchy, raw line drawings and organic shapes meant that they accepted the film as a piece of art as well as entertainment. 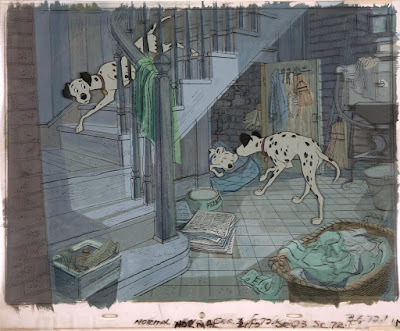 Pongo and Perdita are most definitely flat and graphically sophisticated representations of Dalmatians. Yet no audience has ever had trouble accepting them as real personalities facing real problems. I love the snow scene above. 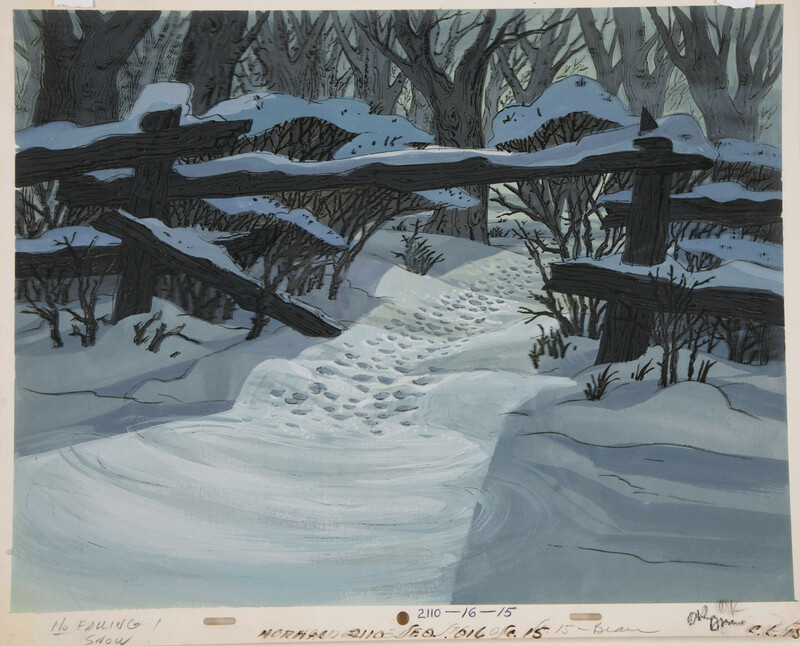 The imagery is stylized, but the light hitting the dogs' tracks seems real. To me this is intriguing, fascinating...and amazing. At the end of the film Cruella's car crashes with the Baduns' truck, she gives off one last rant in utter frustration. She, along with Jasper and Horace, is depicted fairly small on the screen. The overall scenery includes the accident's wreckage. A while ago when I was working on the Marc Davis chapter for my book, I came across the actual animation drawings for this scene. 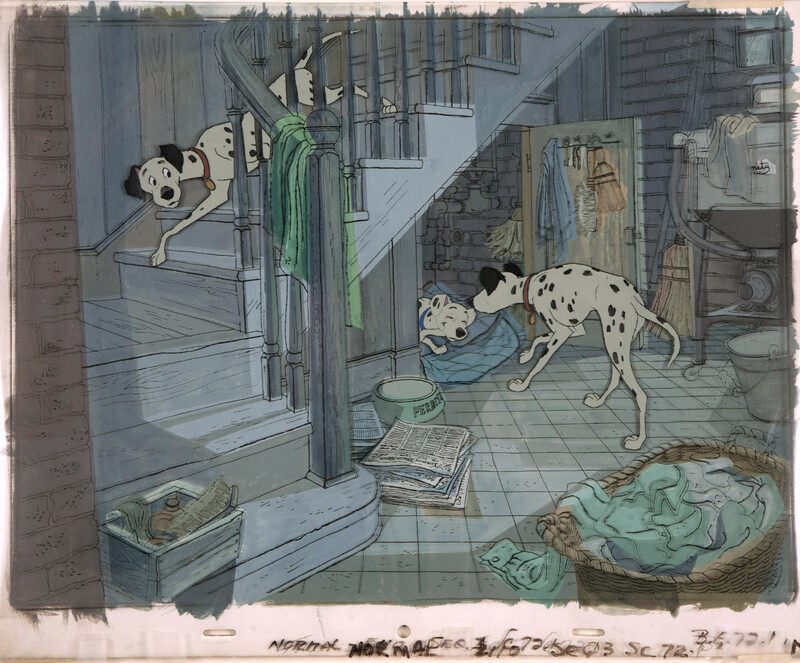 It was surprising to find out that Marc animated Cruella full size, in great detail, before her image was scaled down to fit the scene's layout. I found myself laughing out loud at the facial expressions and body motion. There was no doubt that this scene had to be part of Marc's chapter. You'll find thirty delicious key drawings in the book.